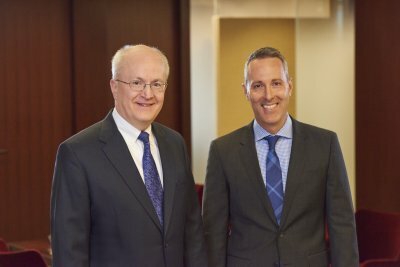 Kevin M. Busch and Timothy L. Gustin were recently re-elected to three-year terms as members of our Board of Directors. Kevin serves as the firm’s Chief Operating Officer, is chair of the firm’s Commercial Department and Banking and Commercial Transactions practice area, and is a member of the Business Law; Mergers, Acquisitions, and Corporate Finance; and Multifamily and Commercial Real Estate Finance practice areas. Tim serves as the Chair of the Board, is the chair of the firm’s Multifamily and Commercial Real Estate Finance practice area, and is a member of the firm’s Banking and Commercial Transactions and Real Estate practice areas. Kevin and Tim will each continue practicing law on a full-time basis in addition to handling their management responsibilities. They are joined on the board by co-directors, Jana Aune Deach, Brian T. Grogan, Richard J. Johnson, and Thomas J. Shroyer.